VR SHINECON has focused on VR headset over 10 years. We have a strong R&D team who keeps developing latest models to meet market demands. We also have a strict quality control system to provide our customers with stable quality products. This VR goggles can't automatically transform images to 3D format, you need to download APPs with 3D format video or watch panorama videos on YouTube, QR code, Apple Store or Google Play. All video sources can be found on Google. -Remove protection film on the lens and wipe the lens with glass cloth before using to get a better experience. -First use makes you a little dizzy for some users, don't worry, later you will feel better. -For clear watching, you should adjust its video quality to HD level or more. -You need to put your myopia glasses in the headset before wear this device. -Change to split-screen mode before phone installed. -Please take the phone case away before use it. THE VR SHINECON -- We are the source factory of VR SHINECON. It has been five years since we focused on the DEVELOPMENT of VR.We are constantly conquering various barriers to obtain the most accurate fitting of parts. EYES PROTECTING -- HD resin aspherical lens are updated to be more smooth and purified. It can completely eliminate the feel of vertigo and provide you high-resolution imaging and the color visual event. 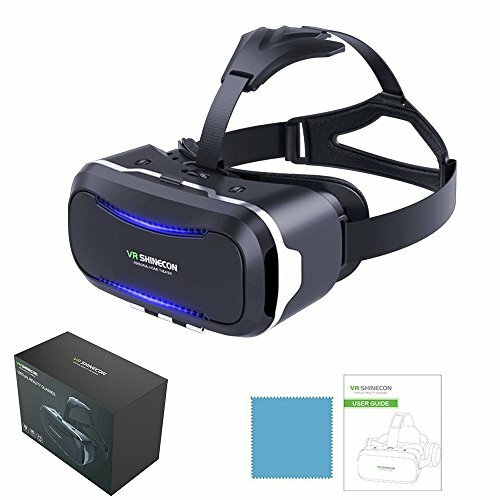 Ergonimic Design -- Adjustable ergonomic T-shaped strap to reduce 30% pressure around your eyes,no dizzziness and fatigue when you using this 3D VR viewing glasses. Light-weight & Comfortable -- Light-weight and breathable and soft leather protector treat your face like a baby's skin, appropriate cutout for nose that helps you breathe comfortably.